We are now in Bahia Tenacatita about 35 miles North of Manzanillo this 55 mile section of the Mexican mainland is called the "Gold Coast" and is rightfully named. Swaying coconut palms line white sand beaches as crystalline water sparkles in the sun. In some anchorages you can enjoy the shade of one of the few beach front palapa restaurants and watch your boat swing at anchor. Or if you choose you can also anchor in secluded coves with no sight of civilization. Two days ago we went on a 3 mile jungle river tour in the dingy. This one was much more jungle like than our previous experience in San Blas. The river is much smaller with a dense foliage canopy creating a low and narrow tunnel through the mangroves and flowering vines. Tendrils of aerial roots dangle like thick ropes from the canopy overhead making one wonder if snakes might drop out from above at any moment. Many small side channels are short loops or dead ends so there was no concern for getting lost as long as you don't linger until night fall. When I say narrow we are talking 8' wide in places with low headroom requiring one to duck down at times. We had some excitement on two occasions having met Mexican Pangas on blind corners and narrowly avoiding collisions as we squeezed by. Yesterday we went snorkeling at "the Aquarium" thus named for its amazingly clear water. It was my first experience snorkeling on a live coral reef and quite fascinating with a collection of fish that made me wonder if I could install an aquarium onboard and collect my own fish. We had one good adventure on the way to the reef as we required an anchor to secure the dingy while we snorkeled in open water over the reef. Having no suitably sized anchor for the dingy we stopped by an adjacent beach to pick up a good anchor rock. The surf was pretty big and a beach landing was not feasible. Never mind, as Casey spontaneously dove out of the boat to swim in to shore to find a “rock” anchor. I commended his intentions but, wondered how he was going to swim back through the surf with a suitable rock in hand. I killed the time riding some of the bigger waves in the dingy and when he started wading out with the anchor I positioned the boat as close as I dared in-between sets of waves successfully picking up the rock and crew. Unfortunately, it took a little longer than anticipated to pick up the crew and anchor and I could see we were “committed” as a big swell was looming and we were too close to shore. I heartily encouraged Casey to hurry up and get in but we were a few seconds too late. 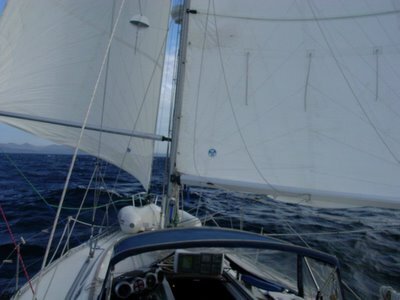 I gunned the engine and we raced toward the oncoming swell. Too late. I thought we might flip end for end as the curling breaker lifted the boat nearly vertical enveloping us with white water. Somehow we ended up upright albeit totally swamped with a stalled engine. As you may know, waves come in sets and we anxiously restarted the engine and plowed the swamped dingy safely outside the breaking waves. In mealy we of course lost the baling bucket but, luckily none of our snorkel gear. Improvising we bailing the 10’s of gallons of water with our snorkeling swim fins. Having returned to La Vie we were hanging out on deck when a small pod of dolphins enter the bay and approached the anchorage. On Casey’s prompt we quickly grabbed our snorkel gear, jumped in the dingy and raced out to “swim with the dolphins”. Have carefully positioned the dingy in the anticipated path of the dolphins we quietly slipped into the water. I must admit I entered the water with much trepidation thinking back to the videos I’d seen of dolphins attacking and killing large sharks by ramming them at high speed. These particular dolphins were busy feeding and thus not interested in our distraction and did not willingly approach us. We did however manage to get within about 10' on one occasion and all things considered it was pretty amazing. The bay we are in now is really nice and calm with just the slightest hint of a swell causing only a few degrees of roll and excellent wind protection. I mention this as most of the anchorages thus far on the trip from Seattle generally have refracted swell. This makes for lots of rocking and rolling and occasional waves slapping the hull quite loudly. Usually, the loudest slaps on the hull occur in the middle of the night rousting one from slumber with a jolt of adrenaline. I'm always keen to alleviate my concerns for the safety of the boat once awakened and make my way on deck to investigate the source of the sound. It's unusual if I don't get up at least once in the night to take a look around and frequently do so more than once. My concerns include wind shifts that could cause the "set" anchor to "unset" and drag and the position of neighboring yachts that could also be dragging anchor potentially putting us both on the beach. Christmas is a huge deal in Mexico and the nationals are already starting to take their Christmas vacations from the many large inland cities such as Guadalajara (7 million) thus many of the normally desolate beach towns are starting to get a bit livelier with the influx of vacationers. Celebrations start in earnest on December 16th which is Guadalupe’s Virgin Day.